I have been a swimmer as long as I can remember, competitively since Age 6. I took a break following my college career- hence how I got up to 200+lbs- but for the most part always been in the pool. I have always had super sensitive skin. Since high school I have been dying my hair so I have tried everything to be sure to take care of my skin and my hair in the pool. As anyone knows a swimmer can be known to have green hair. I have had my issues with brass blonde over the years. 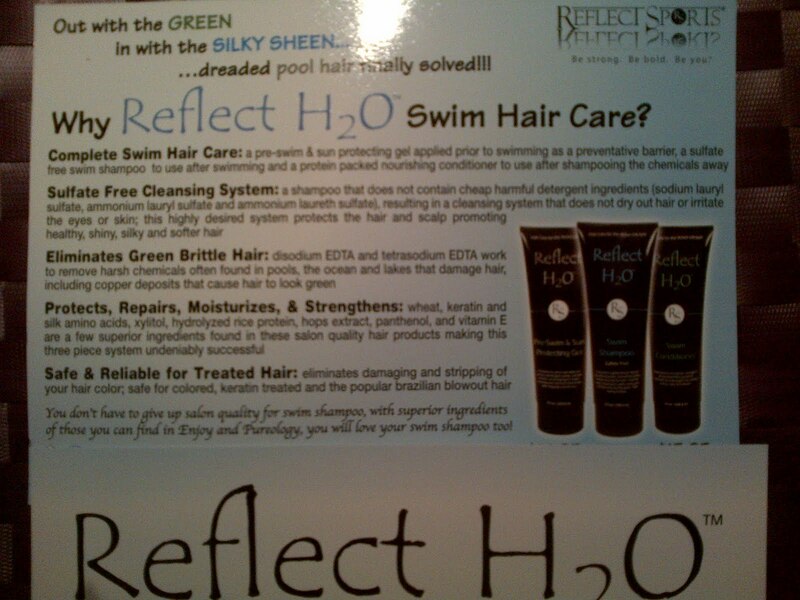 Reflect Sports sent me a bunch of samples of their pre-swim, shampoo and conditioner called Reflect H2O. Since lately my local pool had me itching like a drug addict before I could even get home, a 5 min drive, I was willing to try something new. My skin was crawling from the pool lately and I couldn't imagine what it was doing to my hair. I got up last week for my early morning swim snipped off the top of the pre-swim and ran it through my hair. It kind of left that leave in conditioner feel as I went to the pool. I always swim with a cap, even with shorter hair. The pool was particularly murky this morning- the chemicals were all out of whack. I did my swim popped my cap off and my hair wasn't straw. I headed home to shower. The new Reflect H20 shampoo and conditioner- coupled with the pre-swim left my hair soft and I was missing the good old chlorine smell. I guess it is better to smell of my lotion and perfume than Eau du Chlorine anyway. I have to say this combo worked better than any other swim shampoo/conditioner combo I have used before. I have even bought the expensive stuff at my salon. I have to say I love how Reflect Sports uses natural ingredients to achieve the desired outcomes in all their products! I put enough chemicals in my hair with the fact that I change color just about every time I get it done. 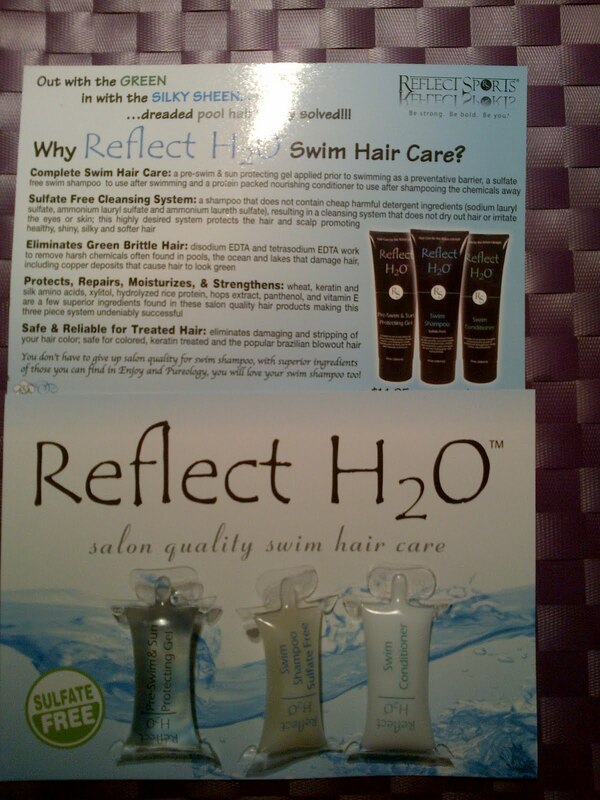 I am excited to now have a set of products that can help keep my hair from being destroyed by the pool! Especially when the chlorine levels at this pool seem to be SUPER high! I have a few more samples and I am doing a contest for a sample pack of the pre-swim, shampoo and conditioner. There will be 3 winners. 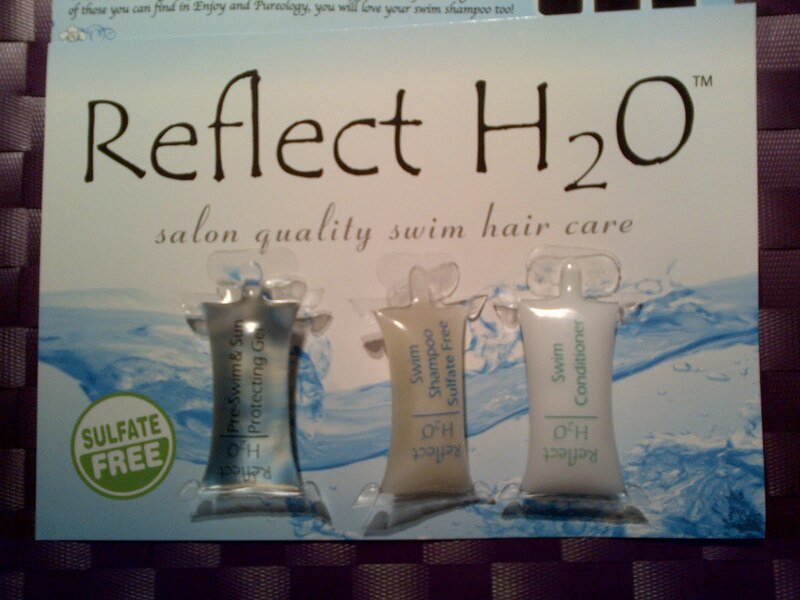 I will do a contest leave a comment about your swimmer hair issues for an entry and for an additional entry tweet "I entered to win the @doubledathlete contest for the @reflectsports #noeauduchlorine #nomoregreen" with a link to this post. I'll throw all the entries in a random number generator and pick 3 winners on 31 Jan! Ooh I was excited when I learned about Reflect's swimming hair care products. I have red hair, so chlorine can make it pretty brassy. I occasionally color my hair too and the chlorine can wreak havoc with that as well. i have very thick hair. even with a swim cap my hair still gets wet and the chlorine makes my normally manageable hair and turns it into one big knot. Chlorine an winter seem to combine and attack my hair making it brittle and dry with a static problem that nothing but a hat contains. Great giveaway! Chlorine dries out my hair - badly. When I was kid, it turned my hair green - luckily that doesn't happen these days! Hello there, I found your blog via Google while searching for a related matter, your site got here up, it appears great. I've bookmarked it in my google bookmarks.